These are indeed sad times for our dear country - Nigeria. The propaganda of the ruling class has crashed, the terrorists are now killing our soldiers, people's children and parents, like child's play. Morale down, no enough weapon for the men on ground. Has PDP also looted the $1bn APC took for weapons? A week after the fighters of the Islamic State West African Province attacked the Nigerian Army 157 Battalion’s base in Metele, Borno State, scores of dead and missing soldiers had yet to be located as air assets have been deployed in the area for search and rescue, according to military sources. A military source told The Punch on the phone on Saturday that the troops that were sent to evacuate the remains of the slain soldiers were attacked by the insurgents and had to beat a tactical withdrawal. 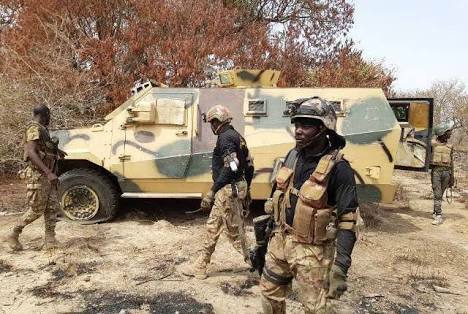 The source said, “As of yesterday, around 10am, troops from 7 Brigade Baga went to Kangarwa 119 Task Force Battalion Defence Company’s location to recover three armoured tanks. They were ambushed and the insurgents carted away the tanks." “The corpses of those killed in Metele are still not evacuated and the soldiers that went for the evacuation were 147. They were attacked at the entrance to Metele,” said the source who spoke on condition of anonymity. Meanwhile, a video has been released on the social media which showed the level of dissatisfaction among the soldiers. In a related development, some soldiers, who survived the attack in Metele have sent a Save-Our-Soul to President Muhammadu Buhari, urging him to probe the quality of weapons procured by the military authorities and save them from further avoidable deaths. In a video sent to journalists in Maiduguri, the soldiers accused the military authorities of providing them with obsolete weapons, which they said were grossly inadequate to effectively confront the insurgents in the ongoing campaign in the North-East. In the amateur video footage, the soldiers also accused military authorities of negligence which resulted into the death of scores of their colleagues in a series of attacks coordinated by the Albarnawi faction of the Boko Haram at Metele in the Guzamala Local Government Area of Borno State. In the video, two soldiers, who claimed to be among the survivors of the attack, narrated the precarious condition of the troops and obsolete equipment which made it difficult for them to repel the insurgents’ attack.